TheRed Devil II Titanium serial pumps are unique through their extremely energy saving performances. The low power consumption in combination with a very positive pump characteristic are not not reached by others. This way the Red Devil saves energy, the environment and especially your wallet. There are two versions of the Red Devil. The Red Devil I (not controlable/AC) and the Red Devil II Titanium (Adjustable/DC). 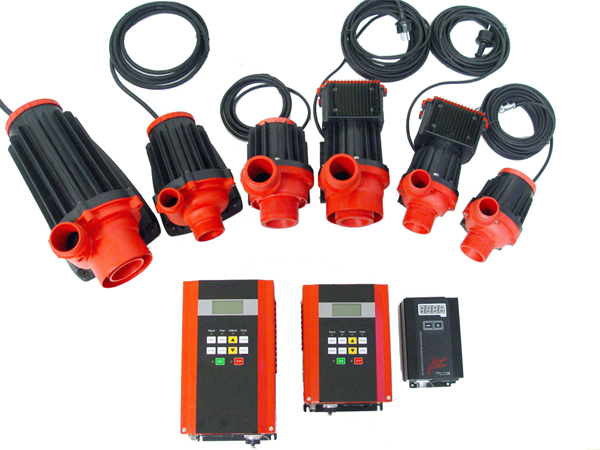 The Red Devil pump is the first really energy saving pump which doesnt use normal electro motors. Also the so called “Eco”-pumps, save only energy by size down the head of water. The Red Devil pumps are perfectly useable in every possible application in which you have to transport water with or without a head of water like waterfalls, multichamber filters, BubbleBead. It is a great alternative for pressure pumps which use typicaly twice as much energy. These result'sare achieved by using a magnet motor for the Red Devil I and a Brushless DC motor for the Red Devil II. The latest innovation is the Red Devil II. This is a pump with a motor base of sinus steered sign wave Brushless DC technology. That sounds very difficult but simply said is, the technology to reach a motor efficiency of 94.6%. This also is the most energy saving driving technique. Due to the technique of an Brushless DC motor it is possible to control your motor with variable speed to suit your requirements. A Brushless DC motor is a direct voltage motor which is fed by an external electronic control. In this electronic unit the alternating current is transferred in to direct voltage. The pump is fully adjustable between 10% and 100%. The use of power input of the motor and water output are parallel in this way. When you only want to use 50% of the output the motor also only takes 50% of his power input. When you use an AC motor this is impossible. A big advantage of a Brushless DC motor is the way in which the electronic are processed. Pumps which can be used under water mostly have the electronics sealed in the motor. When there are some problems with the electronics the whole motor has to be replaced. The Red Devil II electronics are in a separate command console. The Brushless DC motors have an efficiency over 90%, while normal electrical motors have an efficiency of approximately 45-50%. This can be seen on the enormous energy saving. The Red Devil II Titanium can be used in Dry or under water, with the silicium carbid bearings the Red Devils are whisper silent even after years of service . For quality control and optimalising of the efficiency, technical high estimated equipment is used. For definitive inspection of the pumps a very exact test bench is used. Only by constant testing it is possible to reach an high standard. The pumps are being tested on characteristics like water output and the use of energy. A Brushless DC motor is standard adjustable between 10-100%. In fact this means that The Red Devil II Titanium has a three dimensional pump characteristic. After all, every adjustment has a different characteristic. The energy consumption / R.P.M. is totally variable from 10% to 100%. When reducing the R.P.M., the energy consumption will decrease accordingly. Example: 60% less R.P.M. means 60% less energy consumption. Because of the Brushless DC technique, these pumps do not produce much heat which makes them perfect for dry applications. The control electronics are housed in a separate unit. 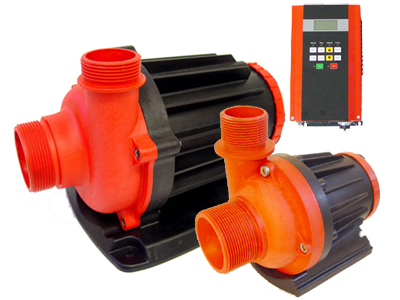 Given the fact that these pumps are suited for dry and wet use makes them extremely versatile for all kinds of applications: ponds, swimming pools, (marine) aquaria, industrial, etc. Saving energy is and becomes more and more important. A nice example of using the Red Devil II pumps is for bead filter system. In filter mode, a low R.P.M. position can be used to save energy for 99,9% of the time! Only during backwash the full power of the pump will be used for a effective backwash procedure.